Do you love when you can find good recipes for your air fryer? When we got my air fryer for Christmas in 2016, my husband had no clue why I wanted one so badly (he was certain it was another kitchen gimmick). Now, a bit over a year later, we can’t imagine being without our air fryer. It is so much healthier than a traditional fryer too, making it great for cooking a variety of things. One of the things I haven’t really had much time to do at all though is try out many air fryer recipes. As I was looking at trying out some various recipes, I was asked to review a new cookbook that seemed perfect to starting out with air fryer cooking – 5 Ingredient Air Fryer Recipes by Camilla V Saulsbury. After reading a bit about this book, I couldn’t wait for it to arrive! 5 Ingredient Air Fryer Recipes: What is It? Life is filled with countless little pleasures – crispy, crunchy fried food is one of them. But why stop there? What if your favorite fried foods (and so many more) could be made with a small number of familiar ingredients, minimal preparation and little time? If that sounds too good to be true, think again, because such recipes are yours for the making in 5-Ingredient Air Fryer Recipes. All of the recipes in this collection require no more than five ingredients (excluding salt, pepper, water and cooking spray), and most can be fully prepared in just 15 to 20 minutes. Each recipe is unique, designed exclusively for the air fryer and downright delectable. The results are every bit as irresistible as higher-fat options – perhaps even more so. Moreover, each dish is delicious proof that a recipe needn’t rely on expensive, hard-to-find ingredients and complicated steps to be excellent. Whether you are a novice or a well-seasoned air-fry cook, you will find recipe after recipe that delivers impressive results, time and again. This collection will inspire you to head to the kitchen to let the air-frying fun begin. The recipes will carry you through every type of occasion, from an impromptu party with friends to quick meals before and after work, as well as through every season of the year. I will freely admit, I was very excited when 5 Ingredient Air Fryer Recipes arrived. As someone who doesn’t know how she lived so long without an air fryer, I loved the idea of being able to quickly and easily make unique things in my air fryer. Don’t get me wrong, I love frozen meals and quick snacks, but being able to make an actual meal, at home, with ingredients I already have in the house? How cool is that!? What probably made me even happier though is that the book did not disappoint. To be honest, I am amazed just how many fancy things I could make in my air fryer, including donuts, pork tenderloin, and even homemade fried calamari! Probably the best part though has to be the instructions. Every recipe has clear instructions and an easy layout for cooks of all levels to make, making it a great addiction to just about any kitchen. 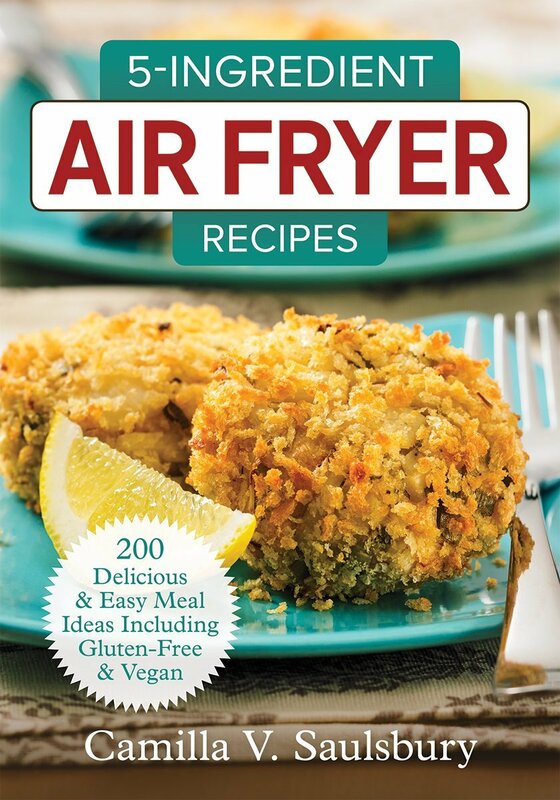 After getting this cookbook, I can’t wait to start cooking and experiment more with my air fryer! 5 Ingredient Air Fryer Recipes: Where to Purchase? Would you like to purchase this awesome cookbook for yourself or someone you know? You can find 5 Ingredient Air Fryer Recipes on Amazon.com for only $17.63. We are certain that once you try this cookbook, you won’t think of your air fryer the same way again! This sounds like a great cookbook. Air frying is so much healthier! These are great, crispy crunchy foods with less fat and better for you. I am looking for lower calorie/lower fat recipes to try. I gave my mom an air fryer last year but she has yet to try it. I love fried foods, but not the fat in them. I’ve been thinking about getting an air fryer but wanted to be sure I had some good recipes to use in it first. These sound great! This cookbook would be great to have. I love my airfryer but do not have any recipes for it. I want to get an air fryer soon. I think I would use it quite a bit. Like that I can have fried food with less fat & calories. And only 5 ingredients per dish…that’s so easy! Air Fryers make fried foods so much better for you. Five ingredients for one dish makes for a quick and easy meal in your Air Fryer. This sounds like a great cookbook. I would love to try a lot of these out for my family. I bought an air fryer a few weeks ago and love it! I need some new recipes and simple is best! This looks like a cookbook that I need to get. I am always looking for quick and delicious things to try in my air fryer. Thanks!! This recipe looks great and I like it is fast with only 5 ingredients. Also love the idea of a healthier version of the original. The air fryer is something I would really like to try. Cooking with hot air and without the oil would be wonderful as we could cook and eat our favourite foods more often. I need to explore getting an air fryer soon. I didn’t think I would use one but now it seems like there are so many healthy recipe options that it would be handy to have. You know, I’ve always been curious about an airfryer – we don’t have an oil fryer here because I am a klutz and they are dangerous around people like me BUT when these came out I became curious. You can make donuts? Now I think I am really going to look into them. Thanks for the review and tempting me! Nice looking air fryer. Could use this in my kitchen to cook food. (5 Ingredient Air Fryer Recipes: What is It?) I have heard of these air fryers before but I do not know anyone who owns one. I know they are better and healthier to use for cooking. I love my air fryer! Look forward to more items to cook in it. I am all for simplifying my cooking. I love that the recipes have 5 ingredients and can be cooked in an air fryer. Sounds so good. I would love to try these recipes. Very Nice Cookbook Hoping 2 Purchase And Air Fryer !!! Amazing !!! This sounds great. I would love an air fryer. I am skeptical that this tastes as good as oil frying. Your article has made me curious to try. You actually don’t miss it. You put about a tablespoon of oil and it is about the same. I could never imagine going back to an oil fryer! We are getting an air fryer. This will come in handy. I need recipes as I’m not sure all what I can cook in this. Ohhh this post has me wanting one of these air fryers. I’d like to try just about everything possible!! Sounds perfect!